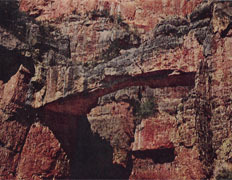 Kolb Natural Bridge, discovered by Senator Barry Goldwater. 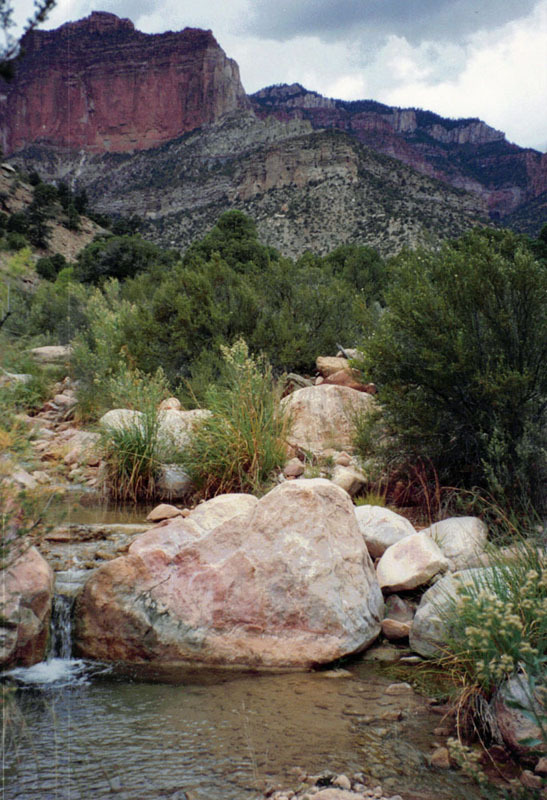 In the fall of 2010, I had the good fortune of participating in the fourth Grand Canyon Hikers & Backpackers Association hikers' symposium, titled, "Echoes & Reflections." 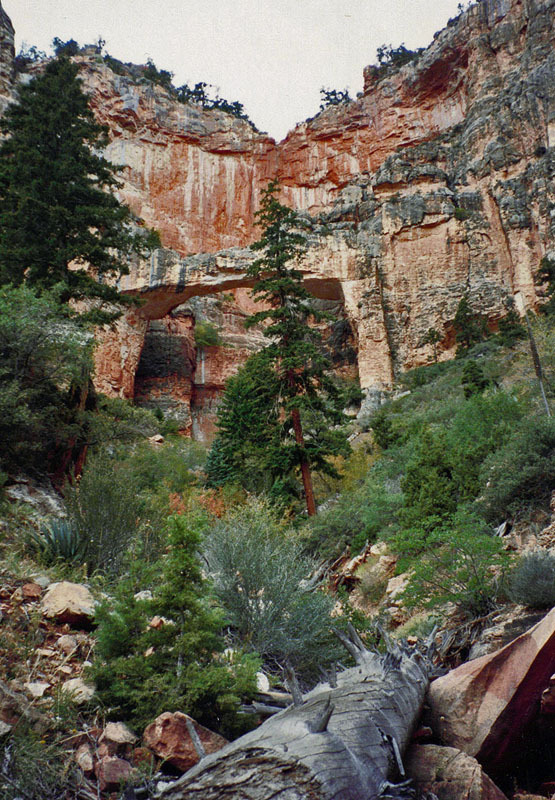 I had chosen to tell the story of a day hike I took up to Kolb Natural Bridge while on a six day solo loop hike through Nankoweap and Kwagunt canyons, at the eastern/northern corner of the main part of Grand Canyon. 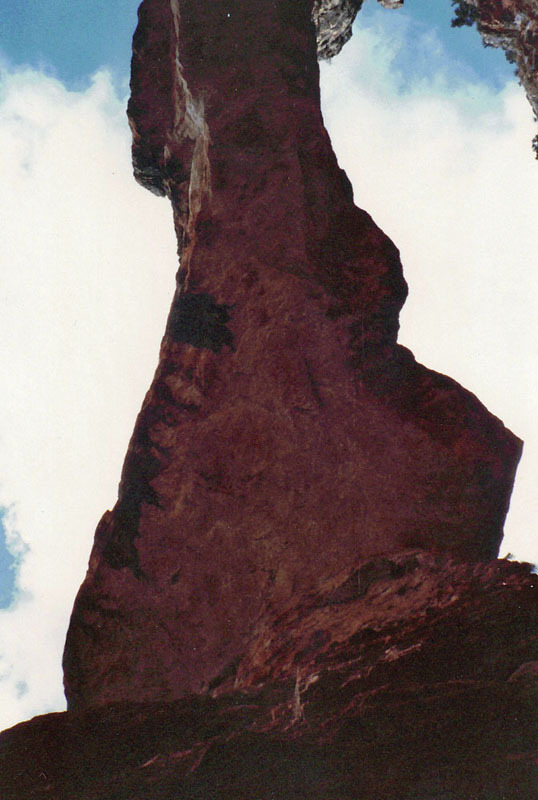 Since I have pulled together photos from that trip and scanned them into my computer, I figure I should add a hiking page to my site with this story. 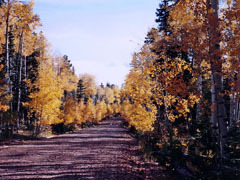 Forest Service road to trailhead. 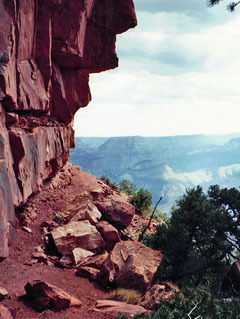 North Rim trailhead is not in the park. Gorgeous fall colors at the trailhead. 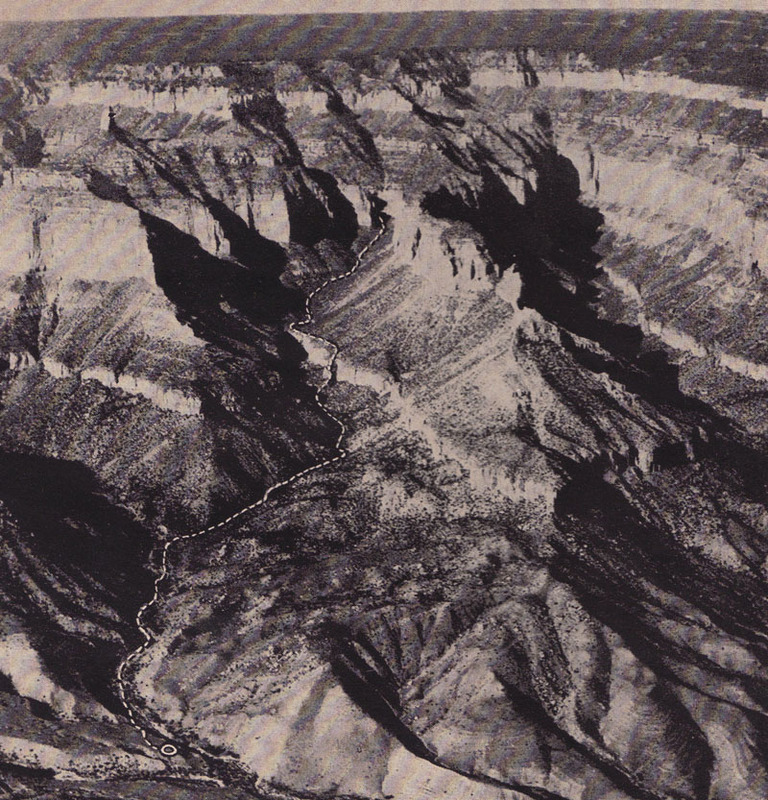 Ever since I first worked at the South Rim, in 1979, my attention would drift to the Nankoweap area of my map. For many years, that section remained a mystery to me. 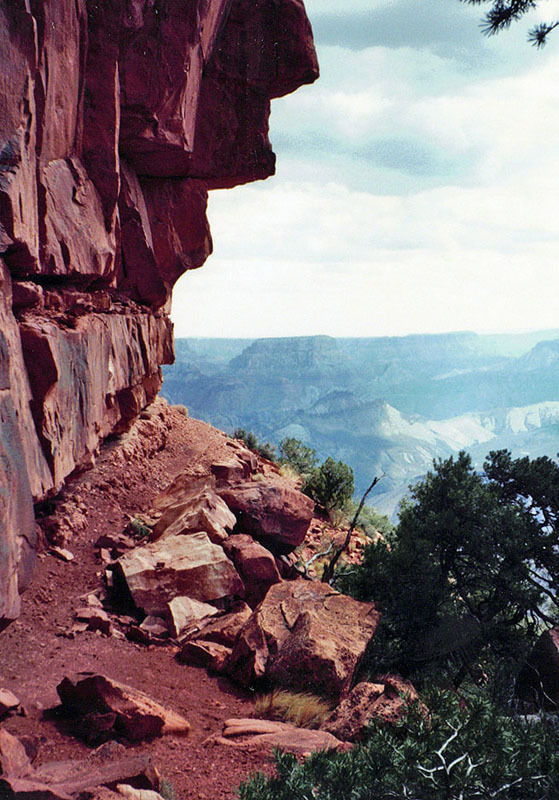 When I was finally able to do some hiking there, I was totally hooked, and it has remained a favorite of mine in the Grand Canyon pantheon. 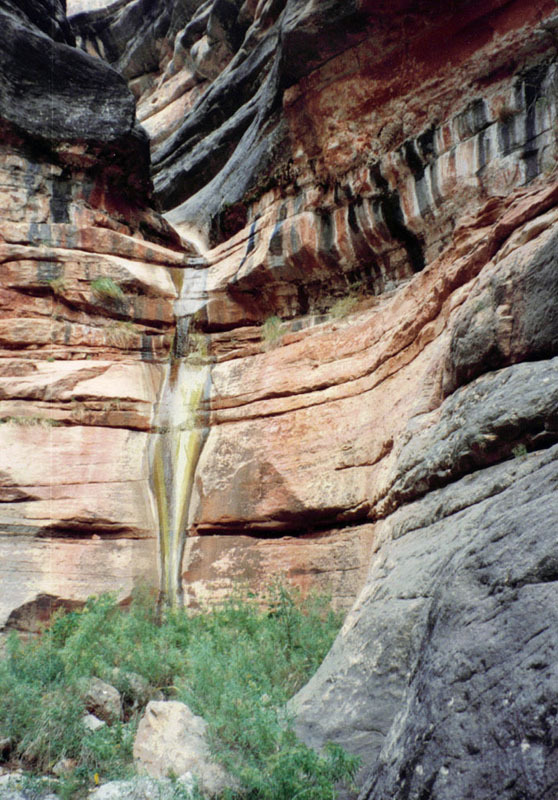 In the fall of 1994, I was able to put together a hike that would allow me to visit two places that I had been yearning to see for some time – Mystic Falls and Kolb Natural Bridge. 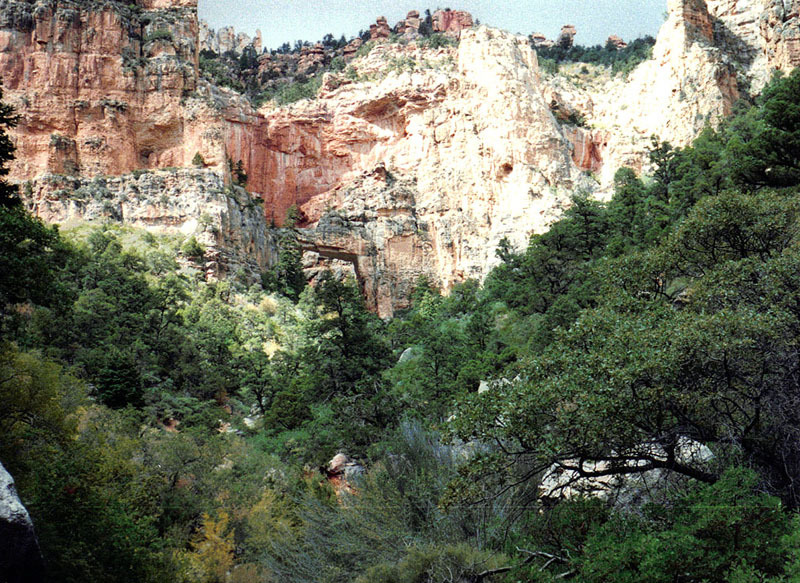 My hiking trip was to be a loop, starting from the Nankoweap trailhead on the North Rim. All told, it took six days, and I did this as a solo hike. I parked my truck at the trailhead and hiked down the Nankoweap trail to the creek. 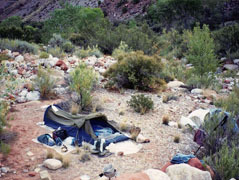 I spent three nights camped there, while taking day hikes to the falls, and to Kolb bridge. Then I hiked up and over into Kwagunt canyon. 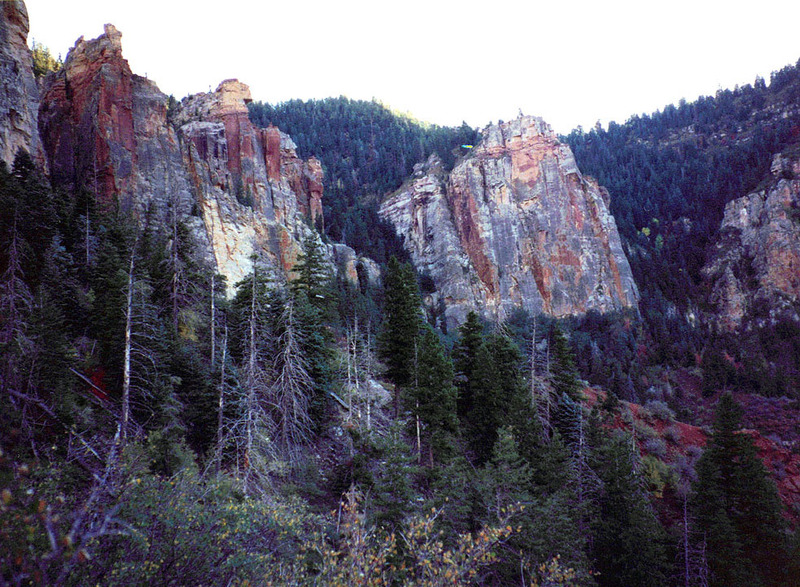 From here I ascended to the rim via the "Atoko Point" route that Harvey Butchart describes. 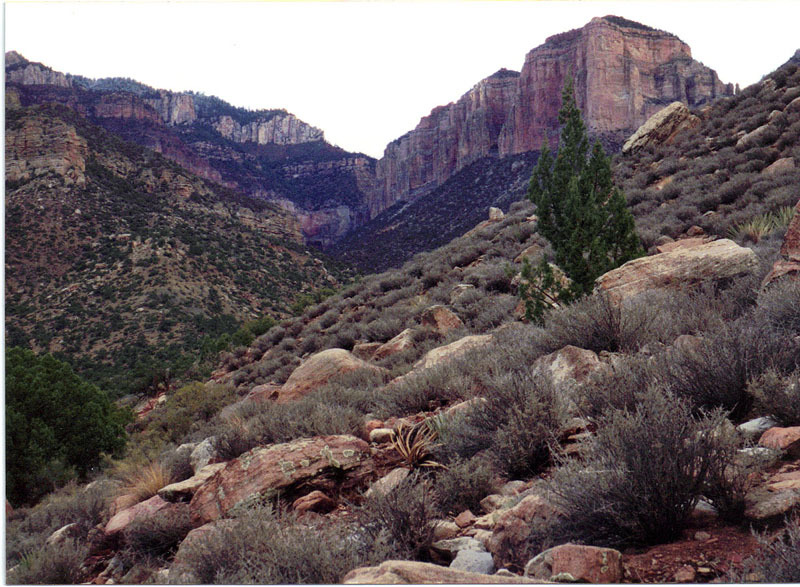 Once I reached the rim I followed the road, the Ken Patrick trail, and the old fire road back to my truck. 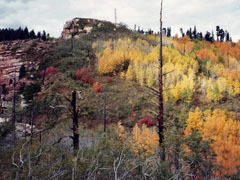 I hit the North Rim at its best in terms of the fall colors. 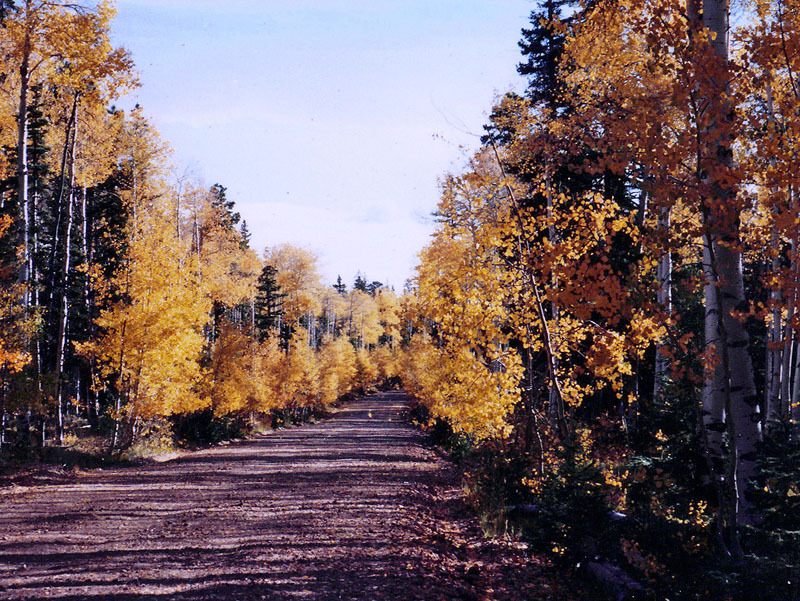 The drive along Forest Service road was just gorgeous, with the aspens all golden. 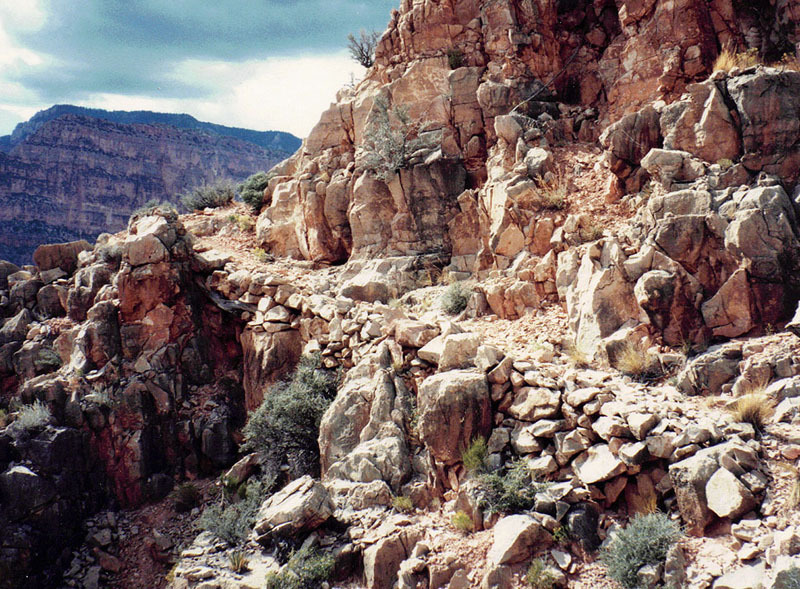 And, once on the trail I was especially impressed by the deep reds along the upper slopes in the Kaibab layer. 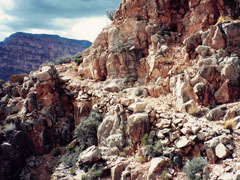 Constructed trail in the Redwall. 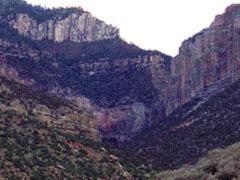 climb over into Kwagunt Canyon. The Nankoweap trail is long, but I got all the way down to the creek on my first day, feeling especially fit and healthy for this hike. 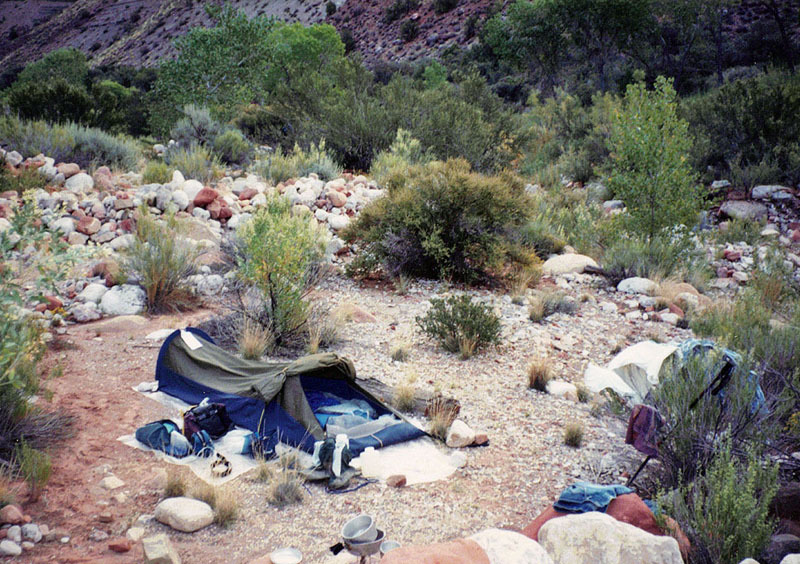 When I reached the bottom of the trail, I went up the creek to find a good campsite that was well-suited for my day hiking plans and for my later climb over into Kwagunt. I used my lightweight Sierra West bivy tent for this hike. 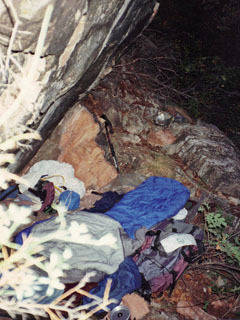 It isn’t very roomy – you can barely prop yourself up on your elbows – but I found that I could stow away all the stuff from my pack in that space and still sleep pretty comfortably. Still, you can probably tell what the biggest drawback is – when it is raining, you can’t get in, or out, without letting in a lot of the bad weather. And, I did get some rain during my three day stay here. But, that was more than made up for by the great scenery - especially the view up to Mt. 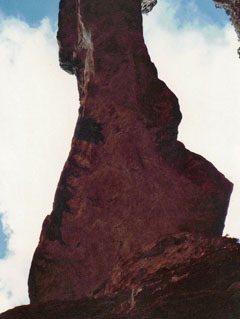 Hayden on the North Rim. 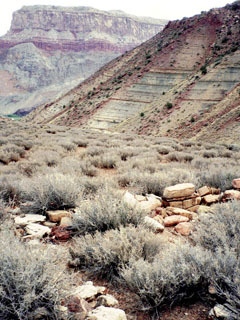 Ruins on terrace above creek. 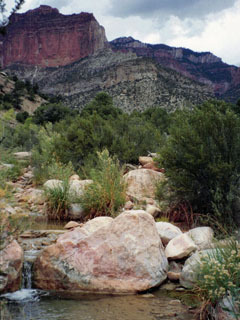 Nankoweap creek. 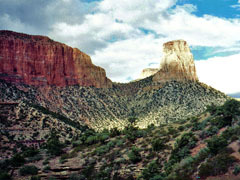 Where the canyon narrows. My day hike to the bridge started on a terrace above the creek. This is usually much faster than fighting through the brush in the creek bed, and it affords the opportunity to look for Indian ruins. 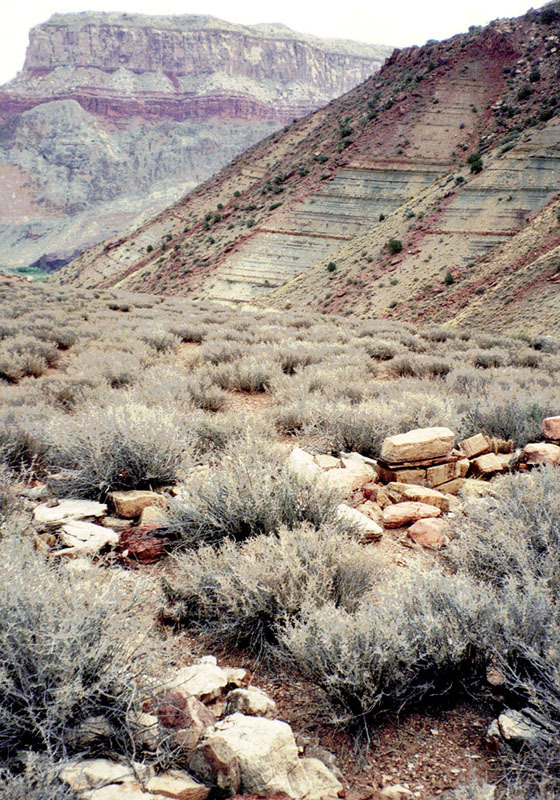 I came across some large rooms that were well outlined in rocks along this stretch. Soon enough I dropped down into the dry creek bed. 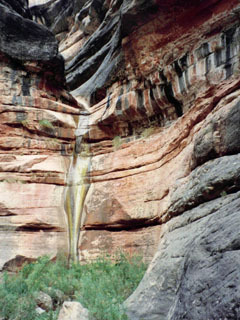 That would stay dry until I reached a fall in the Tapeats, miles up this canyon. The day was overcast and I got sprinkled on by a light rain from time to time. I left my campsite at about 8:20 and after 2 ½ hours I reached a barrier fall in the Tapeats. I looked it over for about 10 minutes, trying to convince myself that I could climb up through it. But, I really didn’t know where it led, and I definitely didn’t want to have to climb back down. So, I backtracked down the creek bed, to a point where I could climb up onto the Tapeats ledges that would take me past this barrier. I picked the north/east side to climb, but once atop the Tapeats I could see a route on the opposite side of the creek that would have worked as well. I have since heard that the other side is a faster route. All told, it took 90 minutes to move about 30 feet in elevation! So, knowing about this fall in advance can be a huge time saver. Above the barrier, there was a small trickle of water in the bed and it started to rain lightly, off and on, for the rest of the hike up to the bridge. It took me about another hour to reach the bridge, and I could see it off and on over the last half hour or so of the hike. Hiking up the main bed, one comes to this fall, which I didn't feel I could climb. So, it was back downstream, just as Senator Goldwater did in 1954. After 90 minutes of hiking back down the creek, finding a break to climb up and then fighting my way through the manzanita, I was above the fall. On my return, the bridge blends in. 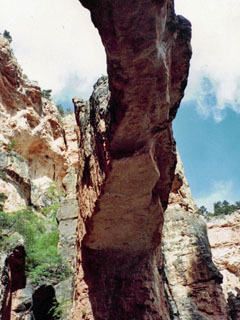 The bridge spans the upper end of this canyon. I had two distinctive impressions about the bridge. One was that it seemed like a theatrical stage setting, with its angular shape. I could half close my eyes and imagine a performance of Oklahoma filling up this space! The other impression I had was that it reminded me of an Indian ruin, with the top part of the arch seeming very much like a wooden lintel above a small doorway. ... resembling a proscenium arch. The bridge in early morning. 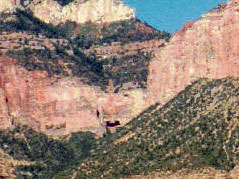 A close-up of the photo above. You don’t have to be right at/near the bridge to see it. You can catch a glimpse from the area to the south of Nankoweap Creek in the early morning hours, when the shadow of the bridge makes it stand out against the Redwall. 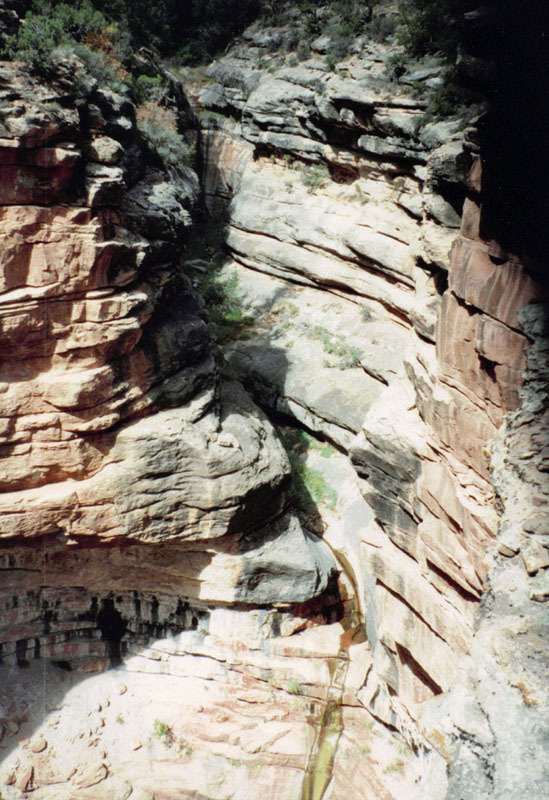 I imagine that, in the future, many boat parties will visit Nankoweap Canyon and the bridge. 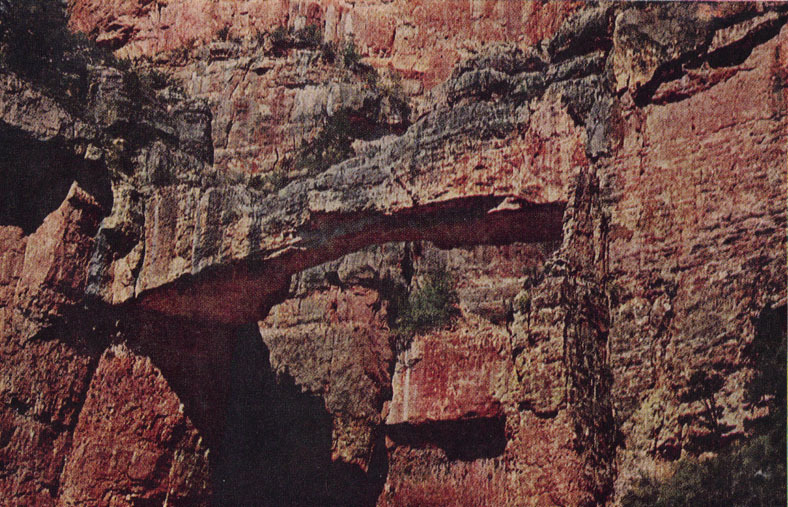 He had hiked up to the bridge in October of 1954, 40 years, almost to the day, before my trip. He, and his companion, Bob Gilbreath, started hiking up just a bit past eight, and returned to Nankoweap Creek at 5:30 p.m. So, I am doubly bowled over, having covered the same ground in virtually the same amount of time. Still, it took them longer to reach the bridge as they only were able to spend about 15 minutes there before heading back down to the creek. Still, I would have to say that hiking up this canyon to the bridge has not gotten any easier since Goldwater first make this hike! 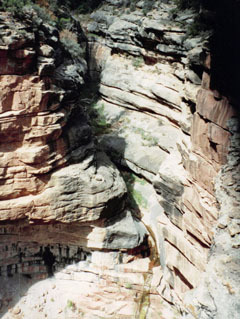 And, then, there’s one more feature of Goldwater’s trek that makes it one of the most interesting in the annals of Grand Canyon adventures. He and Gilbreath flew into Nankoweap in a helicopter! That may seem a bit audacious, but it was really the only option he had to get into this area. 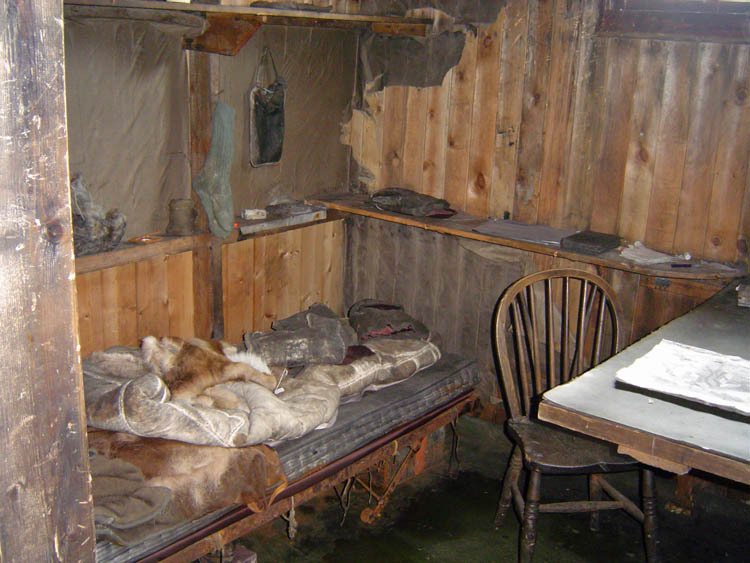 The trail had been long abandoned – Harvey Butchart didn’t first go down the Nankoweap until later in 1955, and he was hardly ever able to follow a trail. And, as hard as it may be to believe now, river runners were still rare – less than 300 people, in total, had ever rafted down the Colorado. Even so, this helicopter trip was no easy feat – it had to be hauled up to Cameron, due to its limited range, and flown in from there. And, they overestimated how long the hike would take them and ended up flying back mostly in the dark! 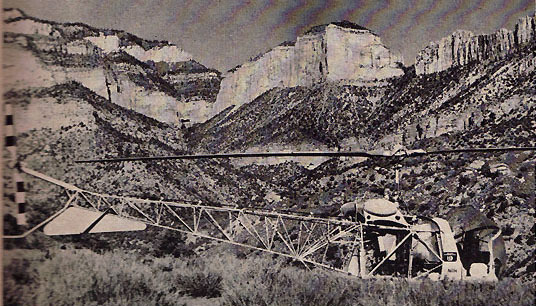 The Feb. 1955 issue of Arizona Highways shows the route that Goldwater took to reach the bridge from Nankoweap Creek, where . . . . . . he landed in this helicopter! 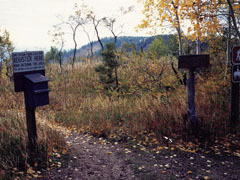 At the time of this trip, Harvey Butchart hadn't yet been down the Nankoweap trail, which was a challenge to hikers for many years. And, less than 300 people (including Goldwater) had ever run the Colorado River through the Grand Canyon by this date. You can see Kolb Natural Bridge in the background, noting it is not too different from my photo. 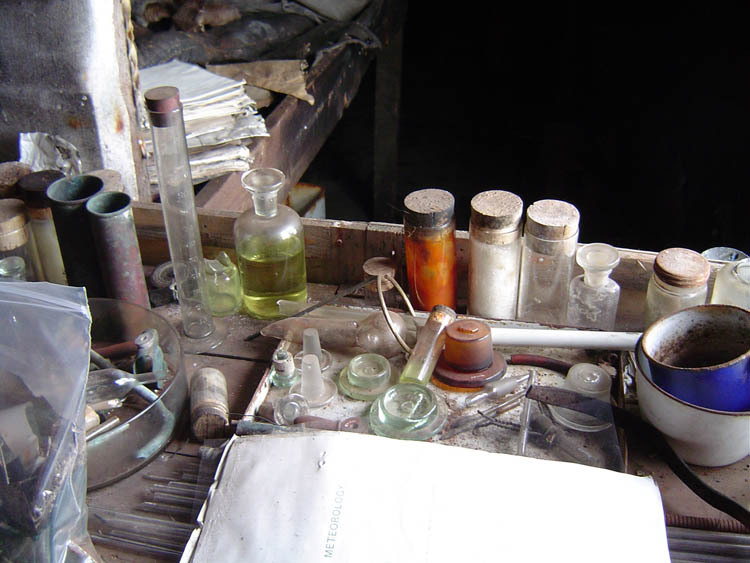 It is worth some space to review the full story here on Goldwater's discovery. He first spotted this bridge in 1951. 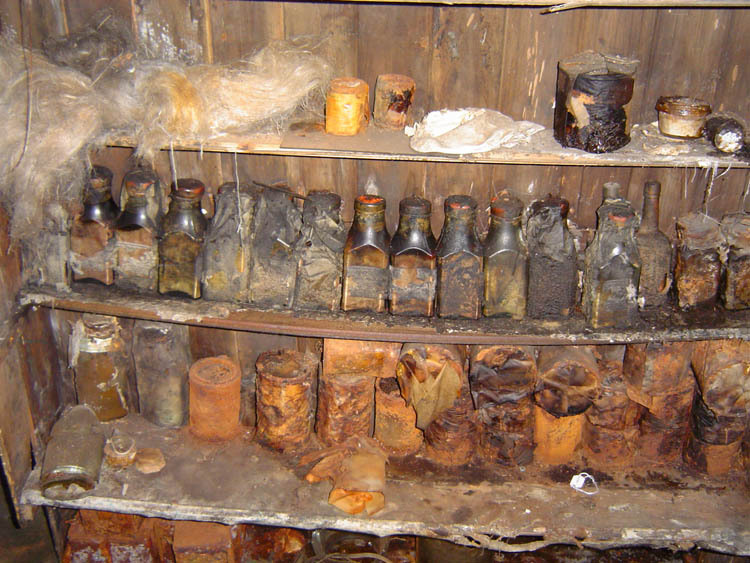 It was August and he had gotten a phone call that the lodge at Rainbow Natural Bridge had burned down. He was a part owner and decided to fly his plane up, from Phoenix, to survey the damage. 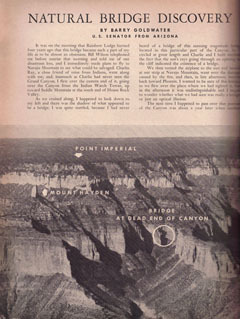 It was early in the day when he left, and he had invited a friend along, who hadn't ever been to the Grand Canyon. So, he flew over the eastern part of the canyon on their way north. 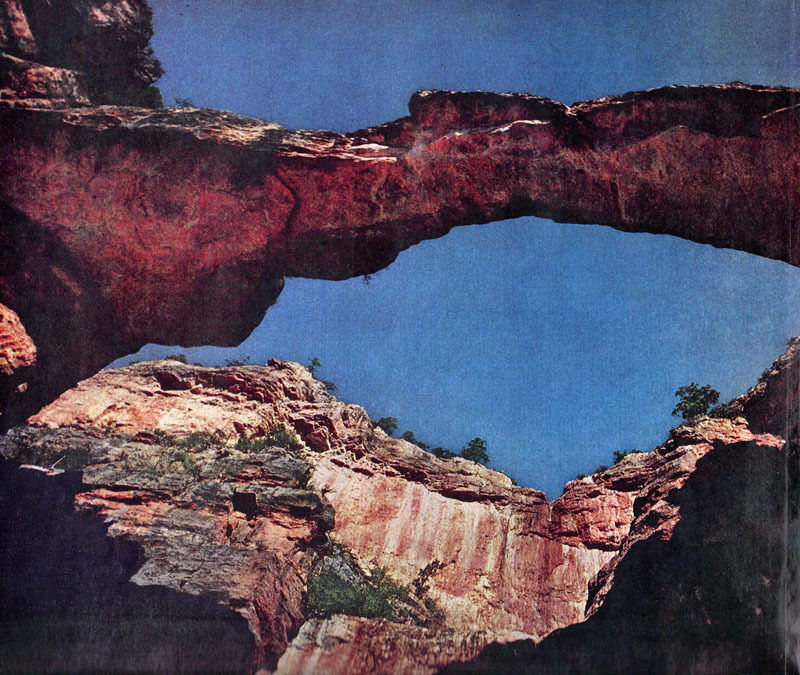 Flying over the Nankoweap area, Goldwater spotted the shadow of the bridge, so he flew around a couple of times to confirm that they were, in fact, seeing a natural bridge. Later in the day, on their return, they would see no sign of the bridge. Later, when he asked park officials about the bridge, they had no knowledge of any such feature in the upper reaches of Nankoweap. In 1952 he was flying up to Utah on business and swung over the eastern portion of the canyon, and, once again, saw the distinctive shadow of the bridge. But, on his return, he could see nothing of the bridge. Later that year, he flew to Lees Ferry, for the commemoration of a plaque honoring Norman Nevills. He was accompanied by a reporter from the Arizona Republic, and they both saw the bridge. At Lees Ferry, Goldwater tried to explain to a departing river party where they could locate the bridge. They either didn't have the time to look (quite likely) or weren't able to figure out where to look, so the bridge still remained a mystery. In 1953, Goldwater planned to take a river trip in order to to see the bridge, but he had just been elected to the U.S. Senate. Consequently, the demands of his new job kept him from following through. In 1954 he planned another river trip, but it, too, had to be scratched. So, he considered doing a hike into Nankoweap to reach the bridge. 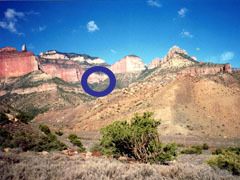 He talked with some employees of the the Museum of Northern Arizona, who had been doing some cave research on Tilted Mesa, in Nankoweap. 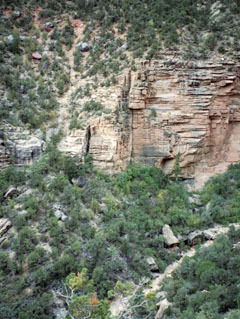 They advised against Goldwater hiking in on the trail, due to it being difficult to follow and washed out in many places. So, he sought out another solution and hit upon the idea of flying in on a helicopter. 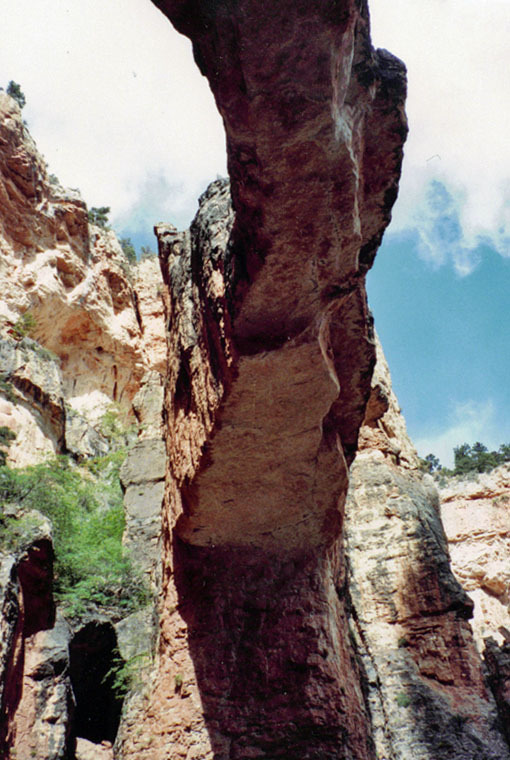 It is kind of interesting to note that, while on his way to the largest natural bridge in the world (Rainbow Natural Bridge), he discovers the largest natural bridge in the Grand Canyon! By rights, Goldwater could have asked that the bridge be named after him. 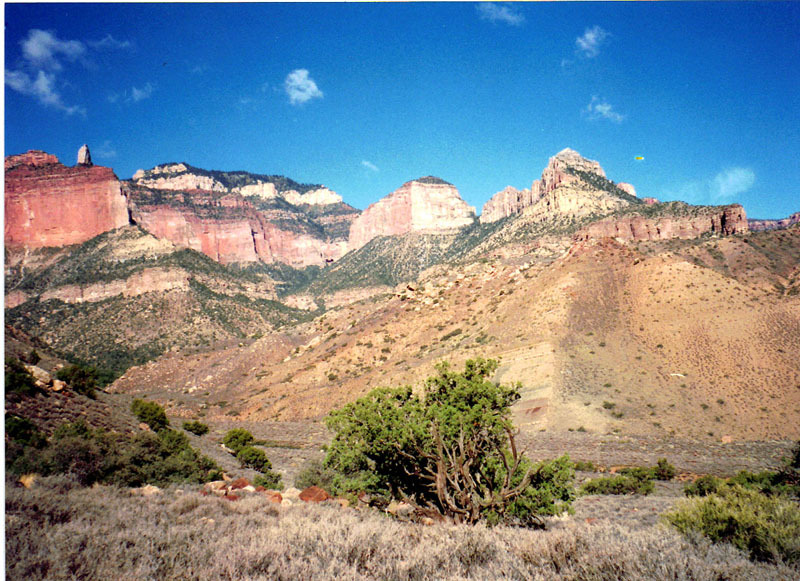 Instead, he petitioned the park service to name it in honor of the Kolb brothers. Well, that tells you a lot about the kind of man Barry Goldwater was. After Goldwater and Gilbreath, Harvey Butchart and Boyd Moore were the next to visit the bridge in person. Tragically, Moore would drown in the Colorado River the next day. It was Butchart's impromptu measurement that was relied on for years concerning the length of the bridge's span. 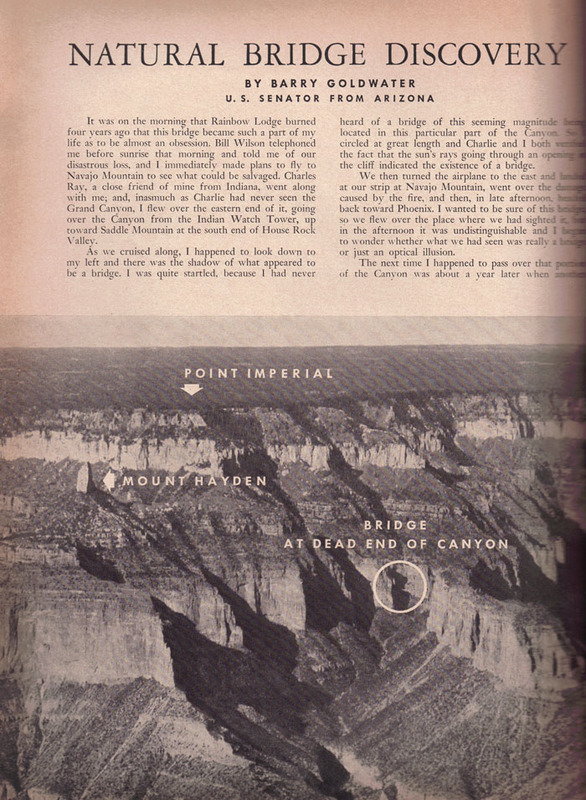 Butchart also wrote that a ranger had climbed down to the top of the Redwall to see the bridge sometime after Goldwater’s trip, but before Butchart visited the bridge in May of 1955, which was only three months after the Arizona Highways story. 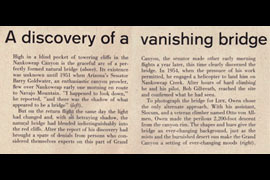 A year later, Life Magazine ran a story about the bridge. Their photographer got some great pictures of the bridge. 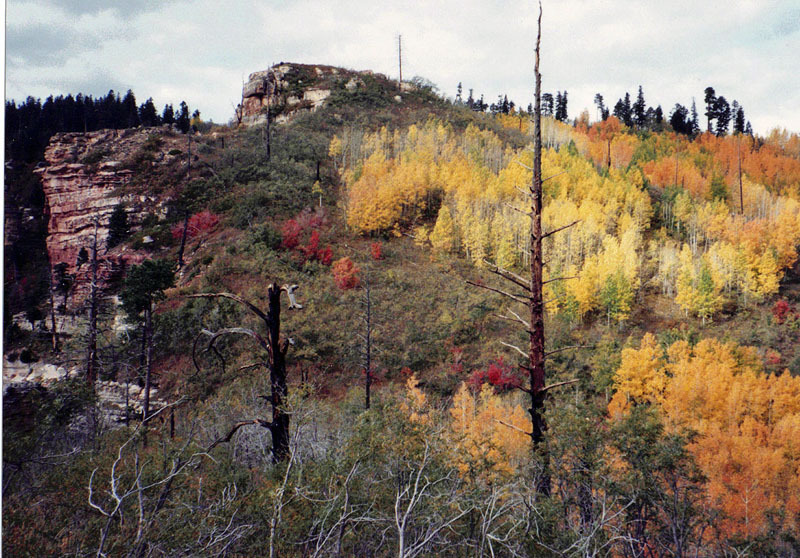 And, unlike the photos in the Arizona Highways, these were in color and quite spectacular. As I read the story, I wondered how they got to the bridge. Upon some reflection, I figured that they must have used ropes, since hiking the Nankoweap was still pretty much unthinkable, and the text mentions that the party “made the perilous 2,200-foot descent from the canyon rim.” This surmise was confirmed later, when I was reading through Harvey Butchart’s trail logs. 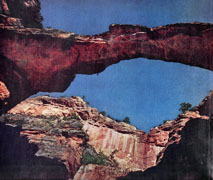 In May 1956, Life Magazine ran a nice spread on the Kolb Natural Bridge, with photos in color. 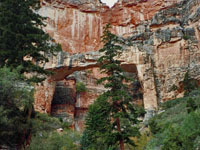 The day hike up to the Kolb Natural Bridge was only part of a fantastic six day hike through Grand Canyon. A fuller accounting will have to wait for now, but I can share some photos of other highlights of this trip - Mystic Falls, the route through the Swilling-Duppa-Hutton bowl that gets one into Kwagunt from Nankoweap, my very narrow camping spot located along a ledge in the Supai layer, and the key break in the Coconino that makes the Atoko Point route work. Up close and personal at Mystic Falls. 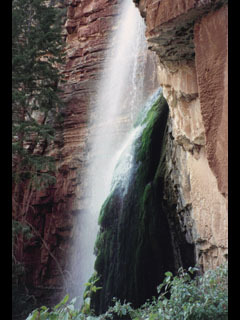 The mossy covered Tapeats reminded me of the more famous Ribbon Falls, along the North Kaibab trail. The climb out of Kwagunt was slow and strenuous. 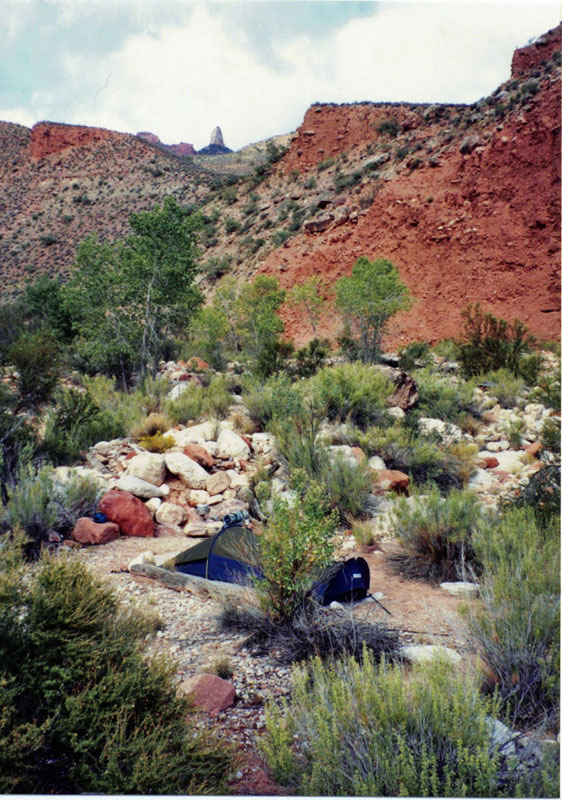 This was my camp site in the Redwall layer, with barely enough space for my sleeping bag. Atoko Pt. route through Coconino. Reliving the excitement of visiting Kolb Natural Bridge is a pleasant distraction from my more vivid memories of this trip - that being the final two and half days. Grueling days! I had gotten over into Kwagunt in good shape (although I had snapped my hiking stick - a ski pole - in half along the way!). I headed up the side ravine west of Banta Point and reached an impassible fall in the Redwall very late in the afternoon. Looking around, I decided to go up on the right hand side (west and north). It was so steep I literally had to grab hold of the trees to pull myself up. It was extremely slow going and I soon ended up having to climb up a series of small cliffs wherever I could find a break. [Later I would ask Harvey about this and he said that he recalled going up the other side and following a game trail!!!] 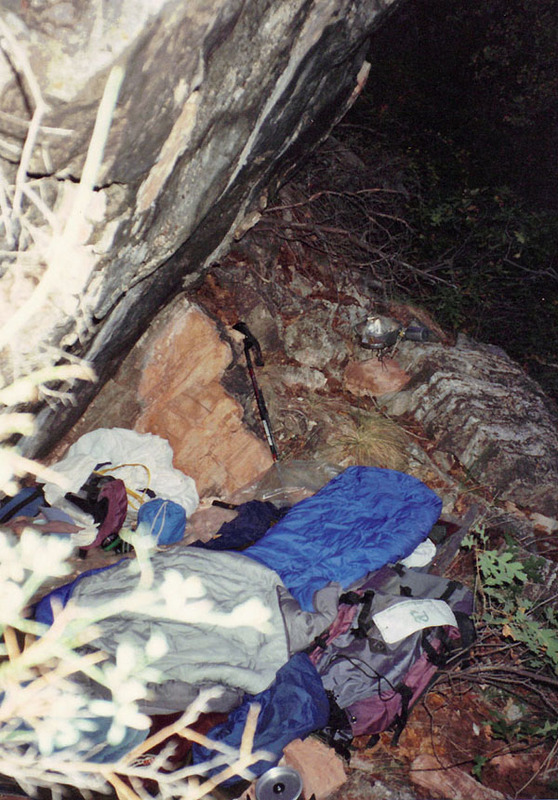 Eventually, well past dusk, I found a spot barely big enough to throw down my sleeping bag. I recall having oatmeal for dinner that night since I didn't feel like fixing anything more ambitious. 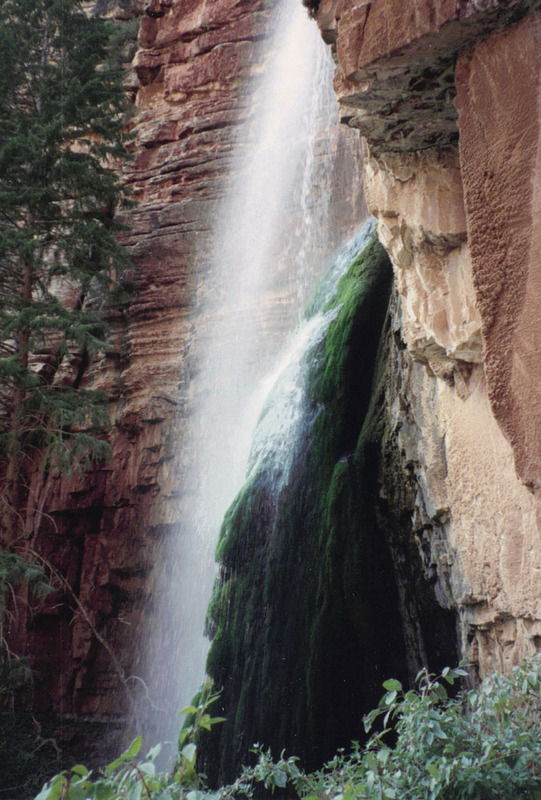 The next day I was constantly fighting through the brush, and climbing up through little cliffs, until I reached the top of the Supai layer. Then I began to contour around, below, Atoko Point. The washed out ravines were steep and the footing was quite awful. At the end of the day I reached the Coconino break. 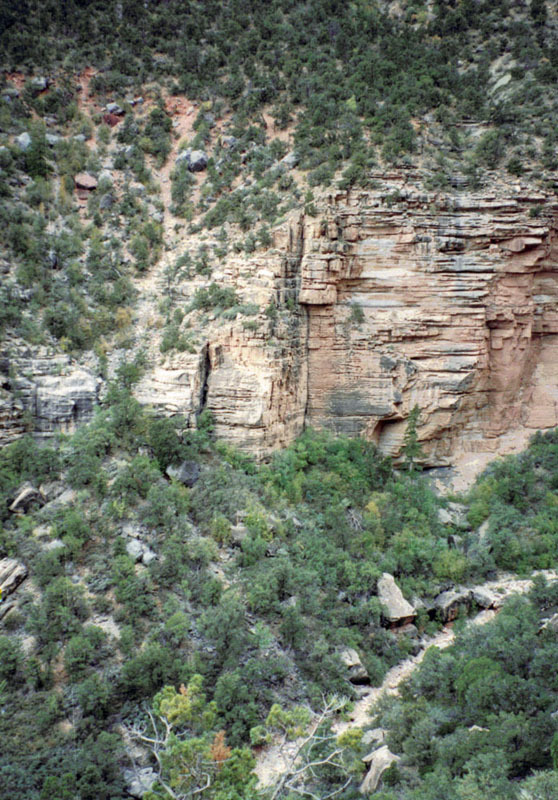 More than ten years earlier, while I was working on the North Rim, I had found and hiked down through this break on a day hike, so I was back on somewhat familiar ground. 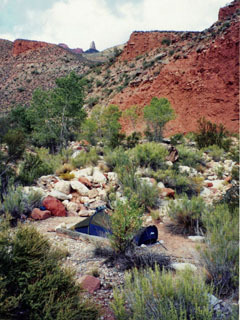 I climbed up through the Coconino, but was unable to continue any further than the Toroweap, where I spent an unexpected night. The next morning I hiked to the Cape Royal road. I followed it to Greenland Lake, which is really just a muddy bog. That didn't matter, since I had run out of water and I had to get some there. It was horrible and I hardly drank it at all - mostly I would just use it to get my mouth wet. Shortly thereafter, I was able to pick up the Ken Patrick trail and follow it to Point Imperial. From there I followed the old fire road to the park boundary, where the trailhead is located in the national forest. It still makes me shudder thinking about how hard those final days were!